Not that we need any more distractions around these parts, but I HAD to get a copy of Absolutely MAD to relive my childhood days of the late ’70s/early ’80s, when a trip to the variety store included purchasing a copy of either MAD, Cracked or Creem, along with some Wacky Packages, Hostess BBQ chips (in the foil bag), Coke in a 300ml glass bottle and perhaps a package of Fun-Dip. 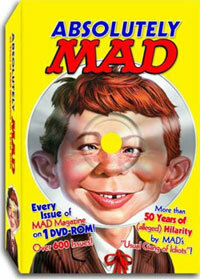 This single DVD includes every issue of MAD from October 1952 to December 2005, including the fold-ins! I just subscribed a few months back, so now all I’ll be missing is 2006, and I’m sure eBay or craigslist might be of some help there.